How can states fund CTE programs to maximize impact? Happy Career and Technical Education (CTE) Month! 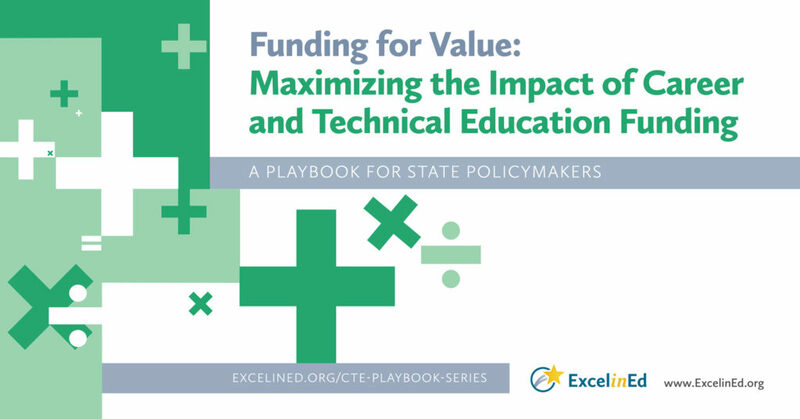 ExcelinEd is excited to share our new CTE playbook, Funding for Value: Maximizing the Impact of Career and Technical Education Funding. In today’s post, playbook co-author Melissa Canney takes a look at how states can states fund CTE programs for value. Enjoy! The recent federal Perkins V legislation offers states a timely opportunity to review their vision for a high-quality career and technical education (CTE) program. States that identify ways to align their federal, state and local resources will be able to maximize the return on investment of critical, but finite, resources. And ExcelinEd’s newest CTE playbook, Funding for Value: Maximizing the Impact of Career and Technical Education Funding, can help them do just that. Each state takes a unique, and often complex, approach to funding education, and these variations are often compounded with CTE funding. Additionally, there is a wide range of possible funding sources and stakeholders involved in providing aligned workforce education. Funding for Value presents various funding models state policymakers can consider as they prioritize their state CTE program offerings and desired outcomes. A look at the various ways states currently structure their CTE funding. Five steps states can take to seize the opportunity of Perkins V and maximize the impact of their CTE funding. Four state profiles on CTE funding for a deeper examination of what states are doing. Take a look at the full report, and let us know if ExcelinEd can help your state develop or improve CTE programs for students. ExcelinEd’s CTE playbook series explores strategies and processes states can use to strengthen CTE program quality and provide students with pathways to postsecondary credentialing and middle- and higher wage career opportunities. Learn more at ExcelinEd.org/CTE-Playbook-Series. Melissa Canney is the Director of Innovation Policy at ExcelinEd. She previously served as the Executive Director of Divisional Operations and Communications in the Division of College, Career and Technical Education at the Tennessee Department of Education. Melissa’s experience in Tennessee included policy analysis and implementation, communication strategy development, grant management and data analysis related to college and career readiness. A Vermont native, Melissa earned a B.A in Sociology from Stanford University and an M.P.P. in Education from Vanderbilt’s Peabody College. She lives in Nashville, Tennessee with her dog Moxie.